The world of Varlonan has changed a lot since the age of humans. The effects of the Age of Human's (see History) end caused the entire world to shake and shiver, sending uncontrolled discharges of magical energy skyward and shattering the moon. When humans reigned, there was a single moon that cycled according to the shadow of the sun upon its surface; now that the moon had shattered, masters of magic had to put differences aside and find a solution to keep the world from being destroyed. Three pieces of rock from the original moon were able to be held safely in orbit by increasing the mana pool (the world's life essence) that allowed Varlonan to mend its wounds. Now that there were also two suns (see 'Twin Suns') in the sky, the moon cycle was altered forever. Where the moon cycled monthly before, it now cycled weekly. This of course had devastating effects on Varlonan, from the tides, to the very creatures living in the world. Exactly how much it has effected the world cannot be determined, but it is said that each night of the week things change... and everyone will have to change with it. Each night has a different moon setting, seen in the above image. If the image isn't changing for you, you can view another version: here. The transitional phases of the moon have varying effects and are seen differently by all, but some of the most common beliefs and information will be noted below. The reason the moons appear so differently in the sky is because of the twin suns light on them. Most of the week only the largest of the three moons is visible, waning occurring between Tuesday and Wednesday, leading to the new moon on Thursday. As the new moon acquires more light, it reflects onto the second moon which becomes visible Friday, and then finally the third moon on Saturday. As the light begins to fade Sunday, the bending and angular rays of the twin suns cause two of the moons to vanish from the sky and reflect on the largest moon in a solid golden color. Once again the largest moon is singular in the sky, reflecting the magical orb and sun's light in different colors each night. The golden color lessens by Monday, a night humans often look to the sky to see a ghostly reflection of the original moon in color. Wednesday frightens many when the hotter spots of the sun mix with the darkening shadows that casts a blood red glow on the moon. The first day of the week, Sunday, has the beautiful Gold Moon. Though there are those that believe in Gods and think that the Gold Moon is a reflection of the Sun God, other theories are more widely accepted. It is suggested that because Saturday night holds three moons, the effect lingers (though lessened) and is passed on to Sunday night's single moon. This causes it to hold extra light and appear golden and shiny in appearance. Though not as bright as the Full Moon, many travellers say that the Gold Moon is useful as a marker within the sky, making directions much easier. The second day of the week, Monday, holds in its sky the Full Moon. On this night, the moon is seen easily in the sky, brightening everything its rays can touch with a silvery light. This moon is rumored to be the largest throughout the week, and provides extra safety for travellers forced to travel at night. Magic in the air tends to thicken on these nights as well, allowing those who rely on magic to use it with more ease and intensity. It's rumoured that this may be a gift from a Moon Goddess, Luna (or Artemis in some cultures). The third day of the week, Tuesday, provides the Blood Moon. There are many stories that try to explain why the moon is red on this night. The most popular is the a tale connected to the story of Felt Helte; In the past there was a great battle. Many warriors fought and died for many nights, their blood covering the grounds they had fallen upon. It is said that the night the war had ended, the moon turned red and from then on the moon would continue to turn red the same day of the week for the rest of time to symbolize the fallen warriors. Another popular theory is that the moon turns red because of the influence of the planet Mars, which reflects its light upon the moon once a week. Either way, it seems this night often brings out the evil side of people, causing crime rate to double; many people are superstitious of this and stay indoors on the night of the Blood Moon. The fourth (and middle) day of the week, Wednesday, is the Crescent Moon. Mercury is thought to be a small planet by theorists, though very bright. Due to its similar nature, its position makes the moon appear to be a sliver; Children say the moon looks like a sideways grin. It's thought that on this night, the moon begins to "rest" and only shines partly in the sky. Most choose this night to relax and stay indoors, leaving their work for nights of brighter moons to see better. The fifth day of the week, Thursday, is the night of the New Moon. Referred to as Thor's Day, or the Day of Jupiter, it has been thought that Thursday is the night of renewal and strength since it follows the day of relaxation. This reflects in the moon as well, which seems to suddenly disappear from the sky. Of course, it hasn't really disappeared, but is instead shadowed and visible only to those truly trying to find it. These nights cast great darkness over the land, and give predators the advantage to hunt their prey. Being the night before the Double Moon, theories suggest that the moon disappears as it prepares to greet its twin the next evening. The sixth day of the week, Friday, is unique because it holds two moons in the sky. The appearance of these moons tend to shift both in brightness, and in color ranging from silver, to light blues or purples; sometimes different from each other. Referred to as Freya Day, or the Day of Venus, the Double Moons seem to cause a romantic atmosphere. Many claim that they fell in love on the night of the Double Moons, meeting their partners while under the stars. Those that believe in the Goddess of Love say that the Double Moons are a gift to encourage procreation amongst the races and that a feeling of longing or passion rises up in individuals. 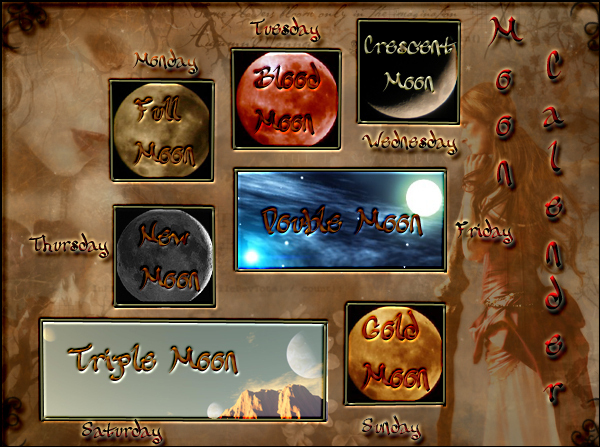 The seventh (and last) day of the week, Saturday, is the night of high influence due to the Triple Moons. The appearance of the three moons tend to change in brightness, and in color ranging from silver, to light blues, pinks or purples; sometimes different from each other or unexplainably appearing different to certain races. Energy runs high on this night, as the extreme influence of the Triple Moons causes people to do actions more frequently and to more extent than they normally would. Often nicknamed the "drunken night", taverns are usually full and busy with drunken fun from singing, loud chatter or dancing, to games or duels of honor. The forests seem to come alive as well, filled with mischievous fae and gnomes, or animals exploring with less worry of predators, showing up in large numbers. One thing is certain: this is rarely the night for work or concentration. With the destruction of the moon, it was inevitable that the world would be destroyed. Varlonan's single sun would not be able to contend with the drastic effects of the three moons. There had to be balance, and wizards of old knew what had to be done. They had already pooled enough magic into Varlonan to keep the moons in the sky, but the solution of the sun would take much more. Nearly every powerful magic user of the time gathered together to combine their magic into a single source, sacrificing their very lives to ensure the binding could not be undone or weakened. As this ball of fire rose into the sky, it grew in brightness and ferocity until it finally rested above the clouds. The twin sun had been born. This smaller twin was not the same as the original, larger version; it was in fact a healing connection to the real sun, with far less intensity. With the magical orb able to ease the stress of the larger sun, the disaster was averted and the world's temperature only rose by a few degrees. Creatures sensitive to the sun of course noticed the difference and cursed the wizards for the hasty decision, but everyone else merely noted the second ball of light high in the sky... finding it almost soothing for the extra bit of light. Since this twin sun orbited the larger sun, it created very interesting effects to the sunrises and sunsets of the day. In the morning, the large sun would rise first and cast its usual array of beautiful light, but now cast the colors further into the sky as the twin sun rose fifteen minutes after. Sunsets effected things a bit more, as the large sun set first leaving the magical twin to be the only source in the sky for fifteen minutes. The magical aura of this twin causes the sunset colors to waver and shimmer on the horizon as if it were dancing. A sight beautiful to behold by all those who appreciate beauty.